A clean home is the first step to your best you! 1. Hang your extra couches on your walls as decorations: It keeps them out of the way, and it looks great, too. 2. Throw away your groceries as soon as you bring them home: Pre-clean your refrigerator and cabinets by throwing away your food before it can spoil. 3. Blind yourself: Sure, this method won’t physically remove the clutter, but you won’t be able to see all of that unsightly trash anymore. 4. Arrange your sponges from warmest to coldest: Organizing your sponges by temperature means never having to dig around for the one that’s the warmth you want. 5. Throw away anything without John Elway’s signature on it: Take a hard look at each thing you own and ask yourself, “Did the greatest quarterback of all time autograph this?” If not, in the trash it goes. 6. 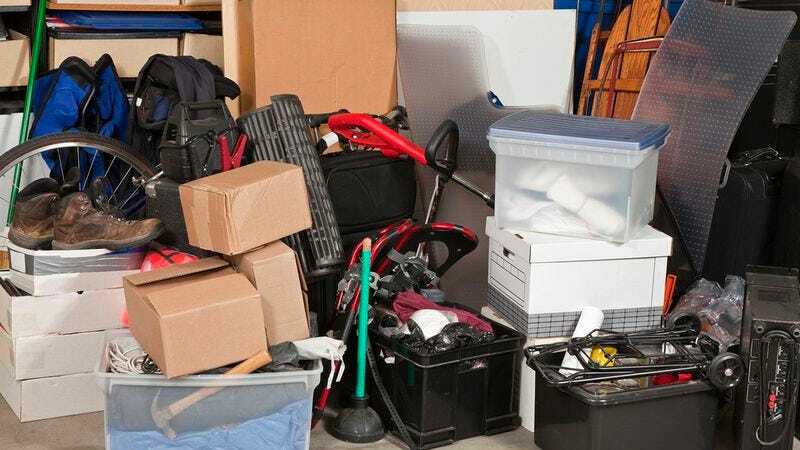 Ask your neighbor if you can put half of your belongings in his or her home: The worst they can do is say no. 7. Just own one really big sock: Why let your floor and closet become littered with dozens of tiny socks when a giant one is easier to put away and can do the job just as well? 8. Throw it into the bathtub, run the shower, and stomp it into some sweet clutter wine: Sure, a lot of it will go bad because no single person can drink it all, but it’s a great way to turn a burden into a hobby!